Read the article at the Cincinnati Enquirer. At a Senate hearing in March, actor and Sudan activist George Clooney was asked about how to keep Americans, especially youth, engaged with the conflict and hunger in South Sudan. Can people here in the U.S. feel a sustained connection to a country many thousands of miles away? Imagine for a moment a country that has recently gained its independence. War, territorial and boundary disputes, and the inability of the young government to cope with emergencies are the tragic realities. Cities and towns have come under assault from their northern neighbor, forcing civilians to flee their homes in terror. Farmers have been forced away from their land by armies, thus ruining food production. What you just read would describe South Sudan today. The description could also fit the United States during the War of 1812. For when the United States was a young nation, like South Sudan now, it experienced war on its soil. This year is the 200th anniversary of the War of 1812, which President Obama and British Prime Minister David Cameron talked about at their White House meeting in March. During that war the British burned the White House to the ground. After the War of 1812 had ended, little by little the two sides moved away from conflict and toward partnership. The Rush-Bagot Agreement of 1817 disarmed the Great Lakes and Lake Champlain, which during the war were the scene of naval battles and fierce bombardments on coastal towns. A naval arms race was averted. This allowed the U.S. border with the British colony of Canada to develop in peace rather than diverting resources into costly warships which might have provoked a new war. One of the most tense standoffs between Britain and the U.S. in the decades after the War of 1812 was over who owned the Oregon Territory of the Northwest. In 1846 veteran diplomat Albert Gallatin, one of the peace commissioners during the War of 1812, published an essay urging calm between the two rivals. His words for peace were what any standoff needs to get resolved. Today, South Sudan is faced with building peace with their neighbor Sudan. The two sides fought a civil war that ended in 2005 with the Comprehensive Peace Agreement. But this agreement has a long way to go before becoming a genuine peace. Last summer, fighting erupted between South Sudan and Sudan over the disputed territory of Abyei. A United Nations Security Force has been dispatched for the demilitarizing of Abyei and to ensure protection and humanitarian aid for civilians. There is also internal conflict in South Sudan between rival tribes, the Lou Nuer and the Murle, that has displaced many thousands of people in the Jonglei state. These two tribes have repeatedly attacked each other over the years through cattle raids and kidnappings. The scale of their battles, though, has increased substantially in recent months. There is an initiative underway to collect the guns that have proliferated in Jonglei and there are plans for a buffer zone between the Lou Nuer and the Murle to help transition to peace. South Sudan desperately needs its own peacemakers before it’s too late. The internal and external conflict has harmed the region’s food supply. Drought has also struck. These two elements, combined with preexisting poverty, are creating a hunger crisis approaching famine. 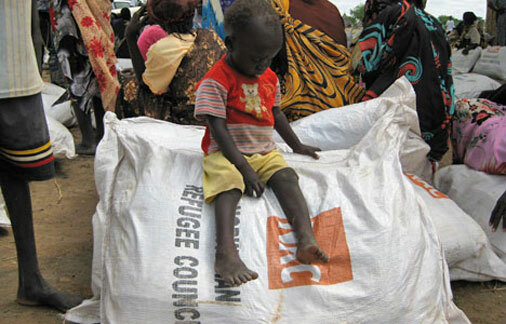 The UN World Food Programme, which relies on voluntary funding, says nearly five million people in South Sudan are suffering from hunger. Food is desperately needed to reinforce the peace process. South Sudan needs the United States and others to stay with them during these rough waters as it tries to build a road to peace. As we mark the 200th anniversary of the War of 1812, students and other citizens can take time to reflect on the peace with Britain that emerged from the ashes. This learning adventure in American history can also offer a way for students and others to connect with South Sudan. How can this newly independent nation build their own road to peace? Article first published as South Sudan and the War of 1812 on Blogcritics. At a press conference President Eisenhower stated, “the concept of atomic war is too horrible for man to endure and to practice, and he must find some way out of it.” In “The Road to Peace” read about President Eisenhower and President Kennedy’s pursuit of a nuclear test ban treaty, a first step in nuclear arms control with the Soviet Union. The attempt to control nuclear weaponry came at a time when the Soviet Union and the United States were engaged in the Cold War. Tensions were running high. A lesser-known arms control measure is also discussed in the book, how the Soviet Union and the United States actually agreed to ban nuclear weapons from at least one part of the globe in 1959. Also read how a diplomat from Mexico led the struggle to create a nuclear weapons free zone in Latin America in the aftermath of the Cuban Missile Crisis. “The Road to Peace” includes the struggles between America and Britain over the Great Lakes and the Oregon territory. The now peaceful border of the United States and Canada did not come about easily. Read about diplomatic initiatives after World War I when the great hope of mankind was an end to warfare. Also, there is a concluding section on the INF and Open Skies treaties. Featured in “The Road to Peace” are notable peace efforts by extraordinary statesmen who served in government here and abroad from 1812 to the 20th century. Lessons of diplomacy and cooperation between countries are applicable to today’s conflicts. 3. Peace After the Great War?